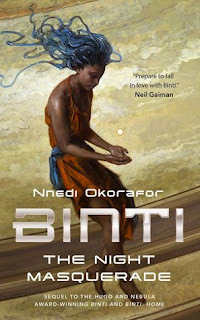 The Night Masquerade concludes the imaginative Afrocentric science fiction trilogy which began with Binti and continued with Binti: Home. In this third and final volume, Binti is away from her family's home when the village is attacked by the Khoush, a people with a long-standing rivalry with the Meduse. She rushes home but it is too late. Now Binti must try to prevent the situation from escalating into war. This story contains many surprising and creative elements, just as the first two did. Binti continues to evolve as a character - not just emotionally, but physically, as she becomes part of many different kinds of people. In the first book she became part Meduse, and in the second she discovered and awakened her powers as one of the Enyi Zinariya. Now, after an act of violence she becomes one with yet another life form. We are transported from her family's village through the rings of Saturn, as Binti tries to save her people from destruction. This was the longest book in the trilogy, and although the story continued to be very creative and full of surprises, I had a harder time getting into it than the first two books. In the beginning of the series it was all strange and new, and I think now a lot of the basics have already been introduced so it's harder to sustain the novelty, even though there were some new elements that appeared here. Although it didn't pull me in the way the first two books did, I still liked watching Binti develop as a character and, honestly, just wanted the girl to get a break. She's been through a lot. Okorafor has written a number of other books, and I'm especially intrigued by her teen book Akata Witch and its follow-up Akata Warrior (I'm not sure if there are more coming in that series) so I may check those out sometime. If you're looking for something out of the ordinary, I highly recommend checking out this author.